A Radical Solo Saddle Chopper! There is so much detail packed into this custom solo saddle chopper and in such unique ways that it makes a ride unlike any other. Created by Tom Utley as his personal ride, his amazing artistic skills show in every part of the design and fabrication. The motorcycle custom body parts were fabricated in Cocoa, Florida by a local shop and Tom built the bike, did all the custom painting and titled it himself. Note the little details like the hooded skull headlight. These touches will pull together all the other fine cutwork we will see in detail. The rear view mirrors are skeleton hand bones. The shift rod is polished chrome in a bone shape. These small additions really help make the solo saddle chopper what it is – a fine piece of art! When Tom moved from Los Angeles to Cocoa, Florida, he needed a ride that would reflect his business well: Jump Them Bones Choppers. This custom chop does just that. The unique details begin with the cutwork on the rear fender. No plain-Jane fender would do for Tom. He drew the flame pattern and had the cutwork done at a local welding shop. The blue paint transitioning to red gives the flames just the right look. Not only is the idea so unique, but the execution is outstanding! Sitting over that wide Avon tire, this fender looks bad and it is bad! The primary cover is another great piece of cutwork with the flames and blue-to-red fade paint. This unique detail is not something you’ll see on another bike. Tom wanted something truly unique and he got it with this design. Just above the primary cover open cutwork you can see the skeleton bone shift rod. This takes the bad-to-the-bone theme of Jump Them Bones Choppers right onto the chopper’s functional parts. Along with the hand bone mirror, all the details pull together to make a cohesive package rather than just a bunch of really cool “stuff’ put together into a chop. Cohesive design is an important point if you want a solo saddle chopper that rules. Anyone can bolt on a front end extension kit and say they have a custom chopper. It’s not true. They have a motorcycle with a bolt on kit added. A true custom chopper will make a statement; have a theme, pull together to create a mood. 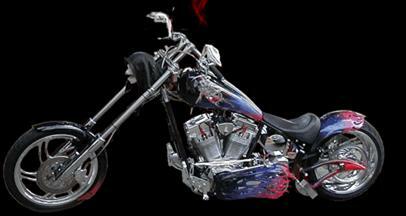 Real custom choppers aren’t just a bunch of bolts holding parts together; they are pieces of art that you ride! In the picture to the left you can better see the details of the flame ends. The exact curves make them so realistic. No plain chrome primary cover would do; this custom job just makes the chop special! The last photo of the primary cover shows a view looking down from almost an on-saddle position. The first coat of paint creates the black highlights, and then the blue fading to red was applied. The whole statement is speed, speed, speed. Just a little thing like the flames curving around the exhaust pipes at left can make a huge difference in the look of a chopper. Painted in the blue to red fade scheme, this little detail makes the other custom cutwork stand out even more. On this particular solo saddle chopper, even the gas tank was custom built to carry along the theme of flames and skeletons. There’s just so much detail in the chop that there is not enough room to show you all the pictures from every angle. And every angle shows a new, unique detail adding to the overall motorcycle. If you think you have a great idea for a motorcycle body design, you can draw up your plans and discuss them with your local chopper builder and a top of the line welding shop, or you can have us design a frame for you, or use any number of plans on our site. Cutwork like Tom’s is not a simple, easy task that anyone who can hold a torch can perform well. There’s also a lot of grinding and finishing work to be accomplished when taking on a task of this magnitude. The cost of a custom solo saddle chopper as unique as the one shown in this report is not low. But the beautiful part is that the motorcycle, if well maintained, will not depreciate significantly. There are always people who want to buy a truly unique piece of art for the road. Remember, riding a chopper isn’t exactly like riding a stock bike. The turning radius is larger and the handling can be quite a bit different, depending on the front-end used and the handle bar set-up. Use caution when first riding your new custom chopper. It would be a shame to scratch such a beautiful machine. This Solo Saddle Chopper Makes A Scary Halloween Bike Doesn't It?